Hello lovelies, I know it seems like summers almost over with the weather being up and down but I am still rocking my flip-flops/sandals wherever I go and there is nothing worse than cracked heels or dry feet in general! I do actually suffer really bad with dry feet, I am on my feet all day looking after my two little monkeys, cleaning, cooking, shopping, chores etc and I have been searching high and low for a good foot cream, I've even tested a fair few too. When I kindly got sent this foot care duo I was sceptical in thinking this cream would do anything even if it does say 'instant recovery' I thought yeah right not with my dry trotters! But I was so wrong, I was amazed the morning after. What I like to do with foot creams is lather my feet in the cream, lots of it and put bed socks on then sleep with it over night to get better results, better results I got! My feet felt unbelievably smooth, I couldn't actually believe it, I've been using this cream over two weeks and my feet feel brand new and I have of-course repurchased it already! If you think your feet are vile, dry, cracked and ugly to look at and your hiding them away in your socks in the nice weather I really urge you to try out this cream you will be amazed with it as much as I was. You don't have to leave it on overnight if you don't like things on your feet overnight I am sure it works just as well, whatever works best for you. I loved that it wasn't a greasy texture at all, it sank beautifully into my skin and how long it left my feet feeling smooth for if I hadn't applied it the next day. Now the party feet cushions, anyone who knows me knows that I'm no 'party girl' I left those days a long time ago, I much prefer a brew in front of netflix, blogging or getting into a new book! Obviously nights out every now and then are good to let of a little steam, get my dancing shoes on and have a good time but I actually found these unbelievably comfortable in my gym shoes! I had been after some gel like inserts for my gym shoes for a while but just never got round to getting any, I used these spontaneously and they do the trick! They make my feet feel so comfy and easier to do my exercises in, so thank you very much Scholl team you have made me and my feet very happy and gorgeous! 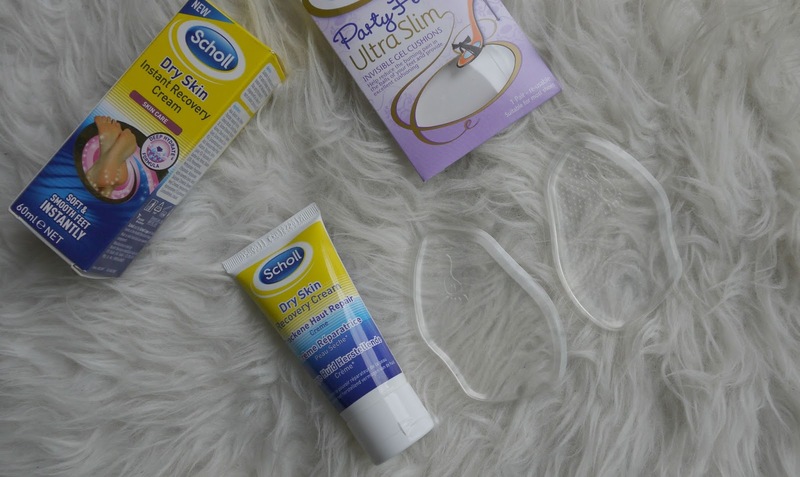 Are you a fan of the Scholl products or even tried any?